Nothing less than excellence will do for Rob Terry. This British wrestling beast uses bodybuilding to hone his insane physique and competitive edge! Want a bodyguard? Want that bodyguard to be 6-foot-5, 295 pounds, and ripped to the bone? If that sounds about right, then Rob Terry is probably your man. Terry is currently the bodyguard for TNA Impact Wrestler Robbie E, but that's not all. The Welsh superstar has made a splash worldwide. As a former MuscleMania world champion and British Invasion stud, he's left a lasting imprint on the wrestling business. Whether in the ring or in the gym, Big Rob is intense. He attacks the weights like he thrashes an opponent: hard, fast, and furious. The weights should be grateful—he's never hit them with his signature "Freak Buster" finisher. 13 to supplement all the sports and activities I was into. Despite my interest in sports, professional wrestling was already a huge factor in my life. I would see these huge superhero-like men on TV battling each week. I looked up to them. I wanted to be like them. I had no idea that bodybuilding would eventually lead me to wrestling. How would you explain your overall philosophy on training? My philosophy on training boils down to one thing and one thing only: intensity. Intensity is what I bring to the wrestling ring and to the weight room; it's what takes me out of my comfort zone and pushes me to the next level. There are many training routines out there. People tend to jump from one program to another. I believe that no matter what program you're using, if you apply intensity, believe in what you're doing, and give 100 percent, you're going to grow. What is your favorite body part and can you share one of your favorite routines? One of my favorite body parts to train would have to be my back, which I consider a weak point. I've acquired that V-shape with wide lats, but because my back is so wide, I need more depth in the center. So, I constructed two different back routines, both of which I hit once per week. Sick. So which bodybuilders and wrestlers do you admire? When I was growing up in Wales, Arnold Schwarzenegger was the man. Every magazine that had anything to do with fitness or bodybuilding, there he was. He was also starting to dominate the action movie scene. I realize now that all his films were influencing and motivating me. They gave me the drive and determination to overcome any obstacle and strive for excellence with my physique. The wrestling world in the late 80s and early 90s featured many iconic wrestlers who inspired me. I would have to say that the Ultimate Warrior and Hulk Hogan encouraged me most. Seeing these two battling it out in the ring was a great and memorable experience for me. How did you join up with TNA Wrestling? As a kid, I was just a fan. As I got older, I realized wrestling was something I really wanted to do. I didn't know how to go about applying for auditions, so I just sent self-made audition tapes to various American Wrestling Federations in the hope that I would be able to get a tryout with one of them. Unfortunately, I didn't hear anything back from them, so I decided to continue bodybuilding. 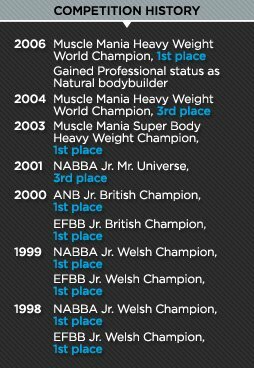 My bodybuilding career culminated in 2006 when I competed in a natural bodybuilding show in Hollywood, California. It was at that show where a talent scout approached me about doing professional wrestling. They were impressed with my physique and told me I had the presence of a professional wrestler. This was my opportunity to move to America and start my wrestling training. In 2009, I was approached by TNA for a tryout. My tryout was successful and I had my debut on April 30, 2009 as a member of the wrestling faction called the "British Invasion." I have been using MuscleTech supplements from day one. Even in my early teens I was supplementing with CELL-TECH and NITRO-TECH. I also use MuscleTech's MyoBuild and NeuroCore. What did you weigh when you started training and what do you weigh now? When I first started training, I weighed around 200 pounds. I was 14 and was very active. I was probably one of the biggest in my class. Right now, I weigh a solid 295 pounds and I'm 6-foot-5. What are some of your biggest lifts? A lot of people ask me this question. I believe that a physique should aways be as powerful as it looks. I have matured, perfected my training style, and still go as heavy as I can. I use good form and a rep range of 8-15. I feel this is the rep range that best works for me to attain a hard and full physique. What are your goals in the wrestling world and who would be your dream opponent? industry and was one of the first wrestlers to inspire me.